[blank]Happy images from a great day spent in the garden. This summer has brought us many visits from blogging friends, and today we caught up with Slavica and Jason of Seductively French. We were blessed with amazing sunshine, happy children, and lively conversation. A great time was had by all. The only thing working against us – the clock!! Next time we’ll take longer . Hope you are all enjoying a great weekend with family and friends. Seductive photos……a beautiful location and gorgeous table setting for a relaxing meal with friends. I packed-away all my garden furniture and parasols two weeks ago. 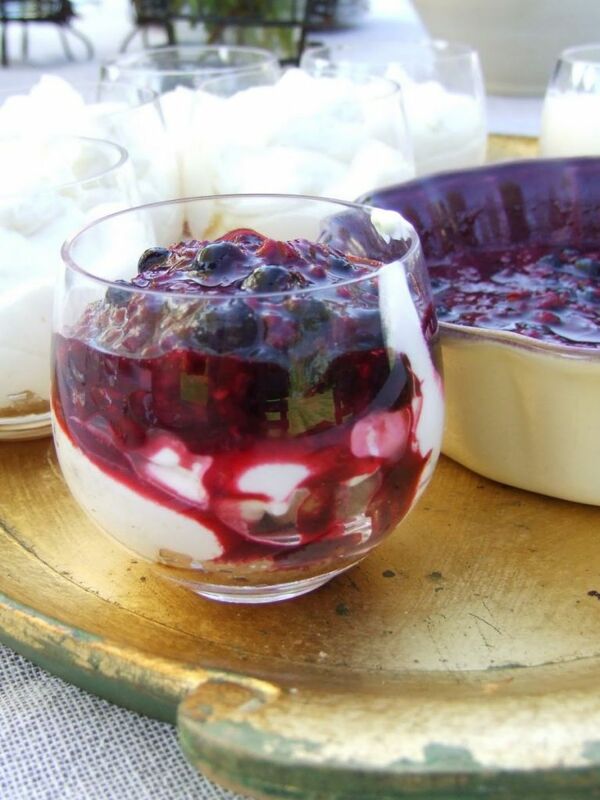 So, it is with an envious heart that I see your gorgeous summery garden party. Everything looks so pretty. Complimenti per la tavola ben curata! 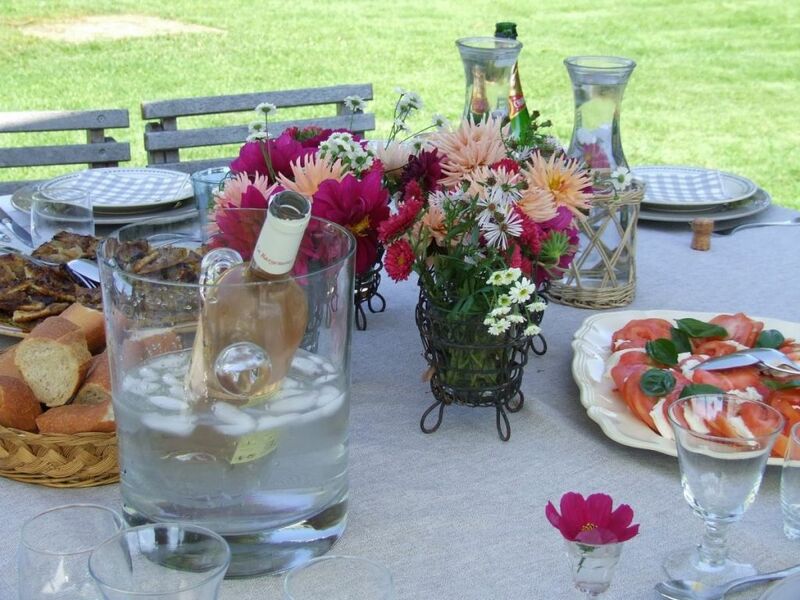 That is lovely for setting an outdoor table. Beautifully done… Enjoy your Sunday! This right here is TOTAL perfection……you set such a vibe here, that the pictures truly tell a beautiful story of a lazy and elegant day spent in the country. Magical!! I am happy that I found this place. Here is a wonderful climate. Here I can inspire. Thank you. It is clearly much warmer there than in my part of Canada. Your setting is lovely. I like the single blossoms in the little glasses next to the larger arrangement of flowers, the white linens and umbrellas. It's all so inviting! 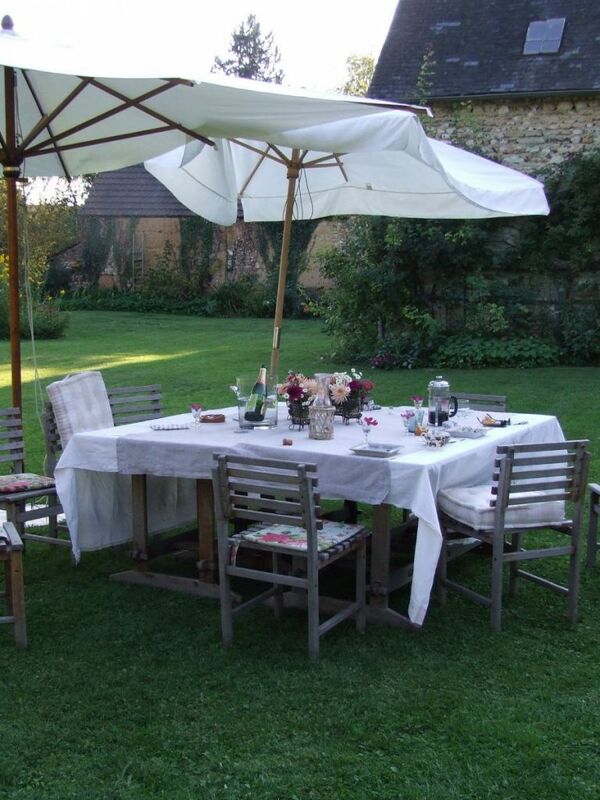 Oh your table looks enchanting and I love the garden setting. 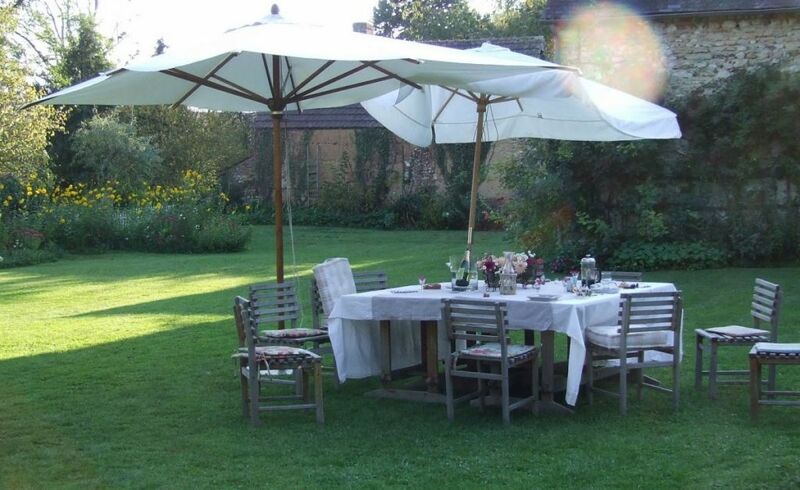 Your umbrellas and chairs look wonderful for dining al fresco…. it's chilly here in the rainy Pacific Northwest and I am wearing a cashmere cardigan this morning. Sharon It is just beautiful!! Such an inviting setting! Fall is in the air here! I hope you will visit my site and let me know what you think of my Autumn decor, so far…..
What an inviting table and the surroundings are just perfect. Oh lovely. I admit that I was craning a bit to try and see more what was served to eat–heehee. Such a gorgeous table too! Tutto una favola! Adoro il tuo blog! 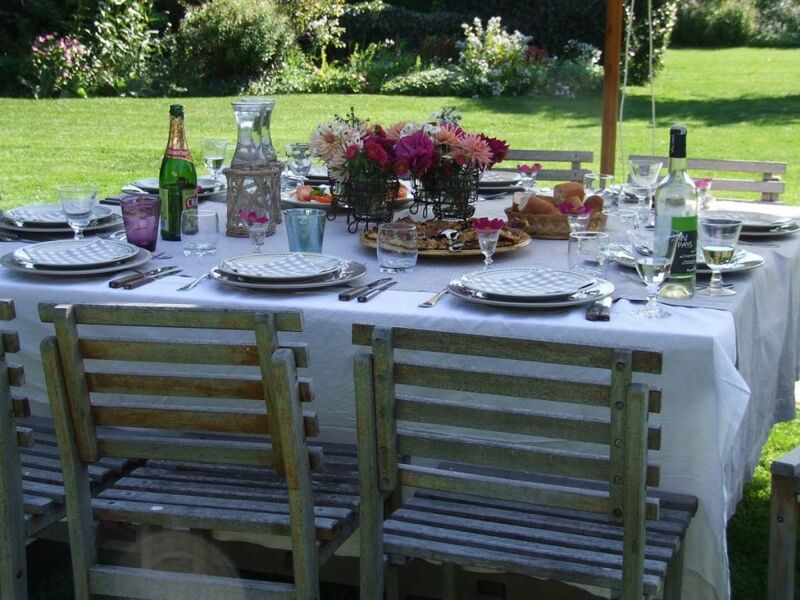 Gorgeous setting, delicious food, great weather and good company makes a great occasion grand. how stunning sharon! i recognized that gorgeous apricot dahlia…….. Thank you for the invitation Sharon – I feel as though I was there with you – it was a perfect meal – perfect setting with perfect friends!! Delicious. Oh oh, if I ever get back to France, may we come for lunch? A day spent in the garden and dining sur l'herbe sounds sooo lovely…especially since I spent my weekend in the basement, of all places, cleaning out a couple (ok, several) years worth of junk and dust and debris.